The most robust of the conveyor series, predominantly used for heavier products such as pallet/drum handling and storage where the product is usually fed onto the conveyor by a machine or fork truck. Powered Roller Conveyors comprise of components that are designed for both heavy duty usage and flexibility. They consist of sprocketed thick walled rollers (complete with torque limiting clutch assemblies), chain to chain or tangential (one common chain) chain mechanism, a fully enclosed side frame and an external shaft mounted motor. Please see below for both powered roller detail and standard module dimensions and specifications. The main reasons for using a powered roller conveyor over the conventional lineshaft system are the robustness and durability combined with the flexibility. They are used predominantly in heavy duty situations (where it becomes impossible to handle manually), including:- Pallet Handling; Automotive Manufacture, and; As fully automated handling and testing stations , eg, vessel building. All mechanical components are manufactured from steel composites, which means life expectancy is infinite (depending on usage). 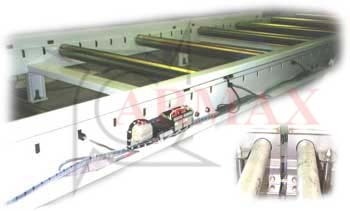 As with all other conveyors the powered roller system can be used into two scenarios:- Firstly, the standard conveying of products, and; secondly the accumulation of products via the zero line pressure system, for use when it is undesirable for loads to be accumulating against one another. Like all other conveyors, a control system can be implemented (incorporating such complimentary products as:- plough/pusher units, transfer devices and photo electric cells) to achieve full or partial automation.